"It isn't as bad as you sometimes think it is. It all works out. Don't worry. and confidence in the future. He will hear our prayers." 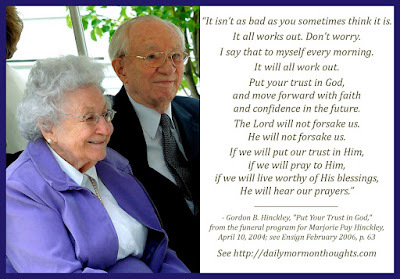 This is a good summary of one of President Hinckley's most familiar and frequent messages: there is always hope, and we should always move forward in faith, with trust in God. 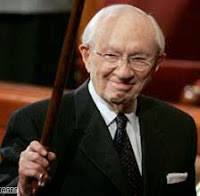 Though he keenly felt the loss of his beloved companion of almost 67 years, he continued to serve with faithful devotion for another 4 years after her passing until he too was called home.